Come over here, dear reader, and join Scott Lobdell, Kenneth Rocafort, and Dan Brown on a guy’s night out! As soon as you come you'll be able to enjoy the jokes being told, the stories being exchanged, and of course, plenty of good drinks and merriment will be had by one and all. The date? April, 2017, and it's time for Red Hood and the Outlaws in review. Since Jason had the opportunity to hang out with Bizarro last month, it only seems fair for him to be able to spend some quality time with our lovely amazon warrior this month, our lovely amazon warrior named Artemis. And what better time to do it than during a search and capture mission for the infamous Cornelius Stirk? As you can expect, the combined might of our two heroes is too much for Gotham’s Underworld to handle, and soon enough, they are able to take a small breather in the company of some quality liquor. Jason takes this slight respite to ask Artemis about her past and her reasons for searching for the Bow of Ra, since, how he puts it: they are a team now and he needs to know anything that might put him and Bizarro at risk. Whereas the previous issue was focused on Jason and Bizarro’s emotional state, this issue is essentially Artemis’ Secret Origin story. Something sorely needed since out of the whole team, Artemis is the character with the least appearances under her belt and the one who had been outside of comics the longest. Long enough that many readers are more familiar with the Artemis introduced on the excellent Young Justice animated series a couple of years ago. Unfortunately I’m one of those readers, as I'm unfamiliar with the bulk of Artemis’ backstory, even though I found Lobdell’s take to be engaging and with plenty of elements to develop into fully-fledged stories. I have to admit, however, that the latter half of the story, the one that actually deals with Artemis' reasons for hunting for the Bow of Ra, is pretty formulaic as far as things go. But that said, that's precisely what's part of its charm. See, the story is framed with Artemis telling her story to Jason. Since Jason takes the role of the audience, Lobdell is able to use him to lampshade the overused tropes present in Artemis’ tale. But do not think this is done in bad faith, as all of it is shown to be in good fun and serves to focus Jason's self-awareness of his standing within the DCU, with thanks to the adventures he has lived through. And as expected, once again Jason and Artemis interactions are the highlights of the issue. Lobdell has such an amazing understanding of Jason’s character that he can easily cast him as a troubled, insightful man, looking to do the right thing, or alternatively, as a jokester, and still he feel's like the same character. Something that so many writers have failed to do over the years. 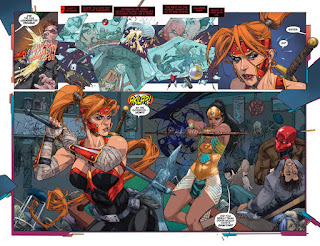 The art for this issue is handled by none-other than Kenneth Rocafort. Marking not only his first full issue for DC since he left for Marvel in 2015, but also the reunion of the original Red Hood and The Outlaws creative team, which disbanded back in 2012 when Rocafort left RHATO to work on Superman. Opening the issue and seeing Rocafort’s bold lines and creative panel layout made me feel incredibly nostalgic, and despite all the time they haven’t worked together, Rocafort and Lobdell are still in perfect sync; making this one gorgeous issue. That said, I do have some complaints about Rocafort’s work: despite Jason being drawn perfectly, Artemis, on the other hand, looks a bit odd on certain panels, as Rocafort reuses the expressive helmet for Jason (despite being a entirely different costume), and Wonder Woman’s first appearance on the book has her drawn in a particularly uncomfortable pose. Minor gripes, for sure, but I simply couldn’t let them pass considering Rocafort’s caliber of artist. Unfortunately, Veronica Gandini sits this one out to let Rocafort’s regular collaborator, Dan Brown, take over the coloring duties. This is a real shame since I would’ve loved to have seen Gandini take on Rocafort’s work. Brown's work is top tier, as expected, but I found his choice of palette a little subdued for my liking. In this issue we have two great fighters trading stories over a drink in the middle of a bad guy bar they just raided together. So there’s just one song to listen to in this situation: AC/DC’s 'Have a Drink on Me'. The story itself depicts its comparison so clearly, as basically its a fun night out between two friends. 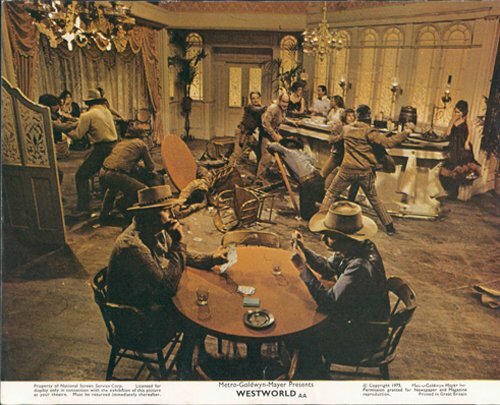 So come on, let's crack some heads and have some drinks while trading stories. What else could one want? As the book gears towards its second major arc, we’re treated with a small story focused entirely on developing the remaining member of our intrepid trio, Artemis. The issue seeds elements that will be important later and humanizes Artemis, giving us small glimpses into what makes her tick as a human being. Pair these elements with Lobdell’s skillful writing and Rocafort’s gorgeous pencils, and you have an issue that is well worth its price for Red Hood and Wonder Woman fans alike.